and Robert Thomlinson were lucky enough to play for the second team! The next week we played local rivals Pocklington, beating them fairly comfortably 4-2. The ‘Beast from the East’ caused a gap in fixtures, and we were not playing to the best of our abilities when we lost against Worksop College and Scarborough College. As a team, we dealt well with the transition from 7-a-side to 11-a-side; half pitch to full pitch. Strong players who were in the B team in Year 8, William Woods, William Ashton and Sebastian Murphy, all helped make a much- improved team. We are optimistic for 2019. 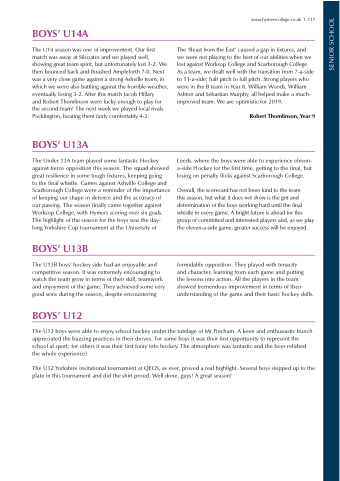 Leeds, where the boys were able to experience eleven- a-side Hockey for the first time, getting to the final, but losing on penalty flicks against Scarborough College. this season, but what it does not show is the grit and determination of the boys working hard until the final whistle in every game. A bright future is ahead for this group of committed and interested players and, as we play the eleven-a-side game, greater success will be enjoyed. the lessons into action. All the players in the team showed tremendous improvement in terms of their understanding of the game and their basic hockey skills. The U12 boys were able to enjoy school hockey under the tutelage of Mr Fincham. A keen and enthusiastic bunch appreciated the buzzing practices in their droves. For some boys it was their first opportunity to represent the school at sport; for others it was their first foray into hockey. The atmosphere was fantastic and the boys relished the whole experience! The U12 Yorkshire invitational tournament at QEGS, as ever, proved a real highlight. Several boys stepped up to the plate in this tournament and did the shirt proud. Well done, guys! A great season!